A visit to a tropical paradise. 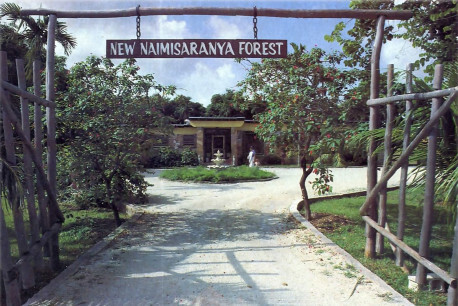 Each week hundreds of guests come through the entrance way – New Naimisaranya Forest gets its name from a pilgrimage site in India. Stunning yellow and orange marigolds and superfragrant night-blooming jasmines are just two varieties that thrive here. Un the distance we see a chickee, a Seminole-style pavilion made of cypress logs and thatched palm fronds. “A few days ago,” says Jennifer, “a woman stopped by the nursery and mentioned she’d just been to an interesting spiritual asrama in Miami. She said I ought to drive up and see for myself. 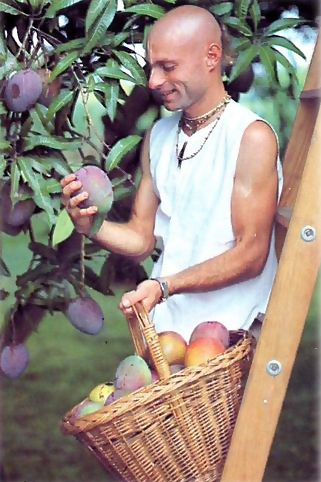 Coordinator Narahari dasa has made grafts from eight of the world’s choicest varieties of mango trees. Jennifer walked in through the Malaysian coconut palms and passed under a sign that said “New Naimisaranya Forest” (after a pilgrimage site in India). A woman in a sari said hello and invited her to sit in the cool shade of a chickee, a Seminole-style pavilion made of cypress logs and thatched palm fronds. Though she had been a vegetarian for ten years, Jennifer found the prasada “a real surprise.” After lunch she joined some other guests for a walk around the grounds. 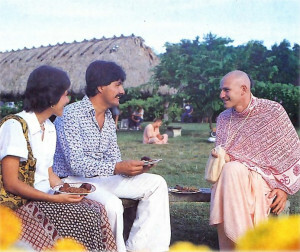 The guide was the community’s Coordinator, Narahari dasa. 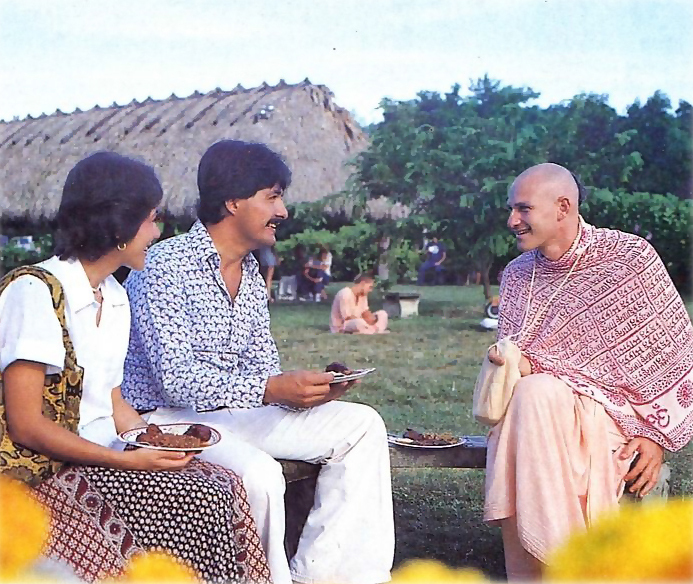 Before starting his work with the Krsna consciousness movement in 1972, he graduated in premed from the University of Maryland and played drums with a number of prominent jazz musicians. 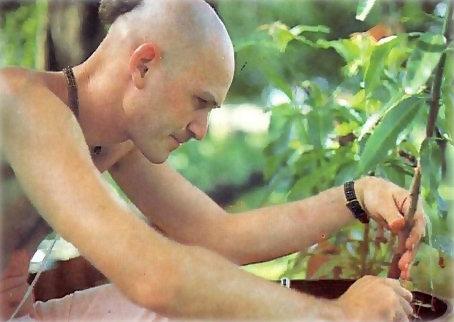 “Now I’m playing the khola [an oblong Indian drum] for Krsna—and wondering what it will be like to hear Him playing His flute. 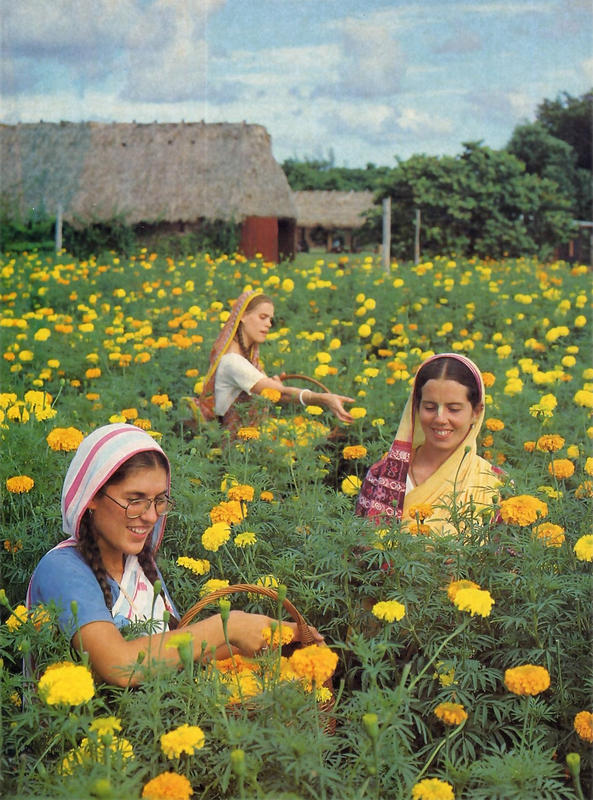 Narahari showed Jennifer and half a dozen other guests the two acres of marigolds, Lake Bindusarovara, the cowpens, the sugarcane field, and the fifty beehives that produce over five tons of honey a year. They also saw the fruit trees, including eight varieties of mango from all over the world, ten varieties of avocado, five of banana (including Mysores and Rajpuris from India), four of plantain (including dwarf Puerto Rican), two of papaya, six of orange, three of lime, two of kumquat, and ten of star fruit (yes, the fruit is star-shaped). And they saw other fruit trees: lemon, grapefruit, litchi, loquat, custard apple, sugar apple, tropical apple, star apple (which tastes like a blueberry sundae), sea grape, fig, pomegranate, governor’s plum, strawberry, Spanish lime, jackfruit (whose fruits can weigh up to forty pounds each), Barbados cherry, Mamey sapote, black sapote (which tastes like chocolate pudding), tamarind, white sapote, bael fruit, drumstick (named for the shape of its pods), monstera deliciosa, golden coconut, miracle fruit, sapodilla, and Jobaticaba (which produces grapes directly from its bark). And the guests saw the cashew, wild almond, and macadamia trees and the ornamentals: pine, silver oak, eucalyptus, bamboo, bougainvillea, bottle brush, and banyan. In addition, they saw—and smelled—the allspice, turmeric, and cardamom plants and the flowering plants: four varieties of gardenia, five of hibiscus, and two of ginger, along with night-blooming jasmine, day-blooming jasmine, orange jasmine, Japanese jasmine, Montezuma, sanchesia, cordia, heleconia, and rose—three hundred rose bushes. and /au (or taki-they grow up to three feet long and hang from trellises like chimes). “Especially in the morning,” says Narahari, “when our guests walk near the flowering jasmine trees and all the rest, they say they feel intoxicated. 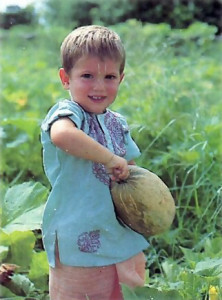 And they say the fruit here tastes much sweeter than what they find in the market or the commercial groves or farms. An international group called the Rare Fruit Council has tasted our fruit, too, and they say the same thing. If guests are surprised at what’s growing here, they’re even more surprised at what’s cooking. Lake Bindusarovara was once a neglected pool. And I tell them that what they’re eating is kofta, breaded cauliflower-potato balls in tomato-spice sauce. And pakora cauliflower chunks dipped in batter at deep-fried in pure butter. And also badas, ground split peas or garbanzos mixed with flour and spices and deep fried in pure butter. Their produce in the temple – through Srila Prabhupada and his spiritual master (lower altar) to Krsna, in the form of Sri Caitanya Mahaprabhu and Sri Nityananda Prabhu (upper altar). 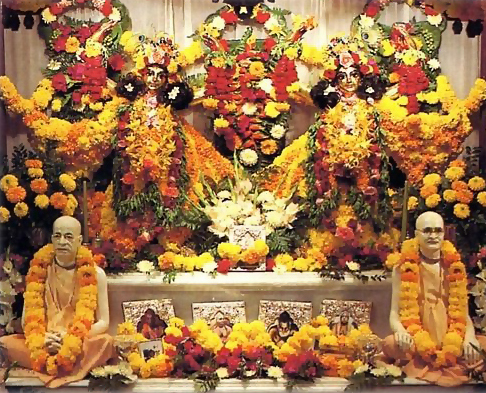 It was Srila Prabhupada who first had the idea of giving Miami a tropical-spiritual paradise. 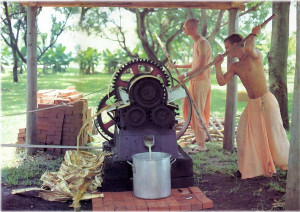 In an early letter to the devotees he said, “You have excellent land there, and you should develop it very nicely. Miami has a nice tropical climate, so our center there should be made lush with fruit and flower trees. 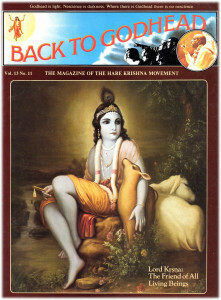 Just work sincerely, and Krsna will supply you with everything.” But New Naimisaranya Forest wasn’t always a paradise. “A jungle,” says Narahari, “—that’s what this place was when we got here. 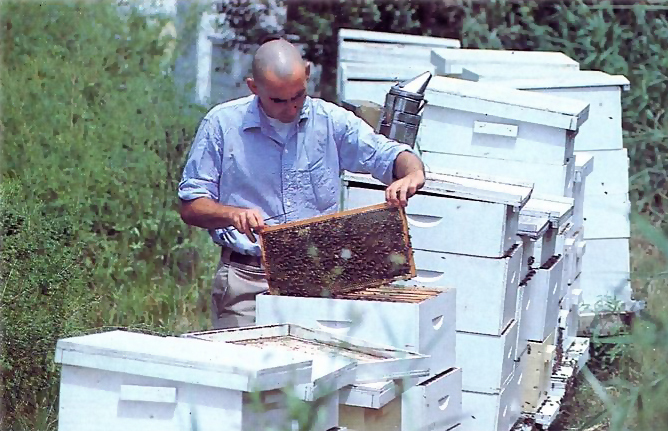 The property had been abandoned for fifteen years. The main house, which no one had ever lived in, was infested with snakes and scorpions. And the underbrush was so thick we had to cut through with machetes. 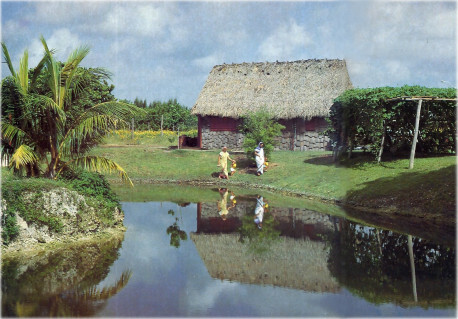 Fifteen years of neglect had made the pond an overgrown sinkhole and the mango and avocado groves a wild mess, and it was going to take a lot of hard work, but we could see tremendous potential here. “Now,” he says, “we’ve completely renovated the main house, and we’ve put in a marble temple room, with a handcrafted altar for the Deities. And we’ve made the old pond into Lake Bindusarovara, with a full contingent of ducks, swans, and rare multicolored tropical fish that swim and play near the surface. Just three years ago, before it became New Naimisaranya Forest, nobody paid much attention to this place. But now people come to visit almost every day of the year. Some, like Jennifer, are spiritual seekers. Others are just friends, stopping by to see how Krsna’s garden grows.